Employers stared down pre-election anxiety and tensions in the Middle East to significantly expand payrolls in October. Following last month’s hiring, total employment exceeds the pre-recession peak by 1.3 million jobs. With the U.S. economy gathering momentum and the Federal Reserve recently ending its stimulus campaign, the focus will increasingly shift to the timing of the central bank’s initial hike in its short-term interest rate. Inflation pressures have been tame thus far, but should inflationary pressures rise, including wages, the Fed may begin to take action. U.S. employers added 214,000 jobs in October, the ninth consecutive month of payroll gains to exceed 200,000 workers. Consumer-oriented sectors made significant contributions. Traffic at bars and restaurants continued to grow, and hiring at these establishments accounted for 52,000 leisure and hospitality positions in October. Retailers also geared up for the holiday shopping season, adding 27,100 jobs during the month. Th e recent drop in gas prices will potentially supplement consumer spending in the months ahead. Oil and gas companies, though, have not curtailed production despite the fall in prices. Oil and gas extraction payrolls added 2,500 workers last month, and no reduction in drilling is expected unless oil falls below $70 per barrel for an extended period. Labor market slack is easing as employers step up hiring. 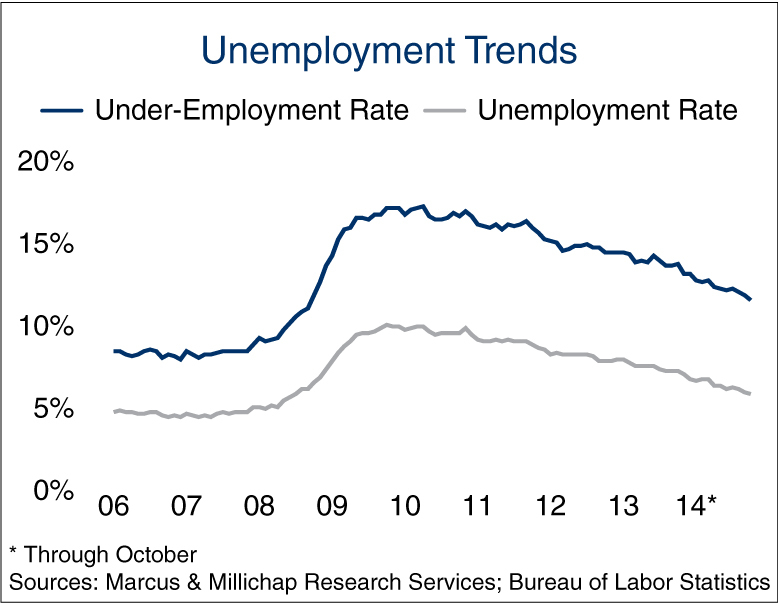 The unemployment rate slipped to 5.8 percent in October, the lowest level in more than six years, and the so-called underemployment rate also receded dramatically, falling to 11.5 percent. Significant wage gains have yet to accompany the reduction in slack, though, as hourly earnings rose nominally in October and are up barely more than the pace of inflation over the past year. Further tightening in the labor market, however, could pressure wages and potentially cue the Fed to consider raising rates. Most indicators point to the second quarter 2015 for when the Fed will begin to edge rates higher. More than two-thirds of individuals ages 20 to 34 rent apartments, and the employment market for this group continues to improve. Following a drop last month, the unemployment rate for 20- to 34-year-olds sits at 7.5 percent, down from more than 12 percent four years ago when the U.S. economy started adding jobs. New tenants will emerge as additional individuals enter the workforce in the months ahead, maintaining downward pressure on the vacancy rate. This year, the U.S. vacancy rate will decline 30 basis points to 4.7 percent. The movement of goods from U.S. ports to manufacturers, retailers and distributors is supporting a significant increase in transportation and warehouse staffing. Including the addition of 13,300 positions in October, more than 100,000 workers have been hired year to date to handle the stocking and movement of goods. New space needs are also arising in warehouse and distribution properties, keeping the national industrial vacancy rate on course to fall 100 basis points this year to 7.1 percent. This entry was written by marcusmillichap, posted on November 11, 2014 at 9:14 pm, filed under Research and tagged Commercial Real Estate, Commercial Real Estate Research, Employment, Unemployment Rate. Bookmark the permalink. Follow any comments here with the RSS feed for this post. Post a comment or leave a trackback: Trackback URL.